When Israel claims it’s the only real democracy in the Middle East, what it touts is the role of the Israeli judicial system in protecting equality and human rights. However, there’s a new law on the books, it’s called the Law of the Nation, that creates a world with this very judicial system itself has become a weapon to discriminate against Palestinians and prevent them from petitioning for freedom under Israeli law. Israeli prisons are overcrowded. Vastly overcrowded. So parole committees were created allowing prisoners to petition for release with time served. Last week, Israeli Defense Minister Avigdor Lieberman canceled those parole committees for Palestinians, the same prisoners who are also petitioning for release, saying that this was reserved only for Israeli citizens, not for Palestinian citizens in the occupied territories. Last week an Israeli court referred for the first time to this new Law of the Nation, which we covered here at The Real News. The court ruled for extra compensation for Jewish victims of Palestinian attacks, using the Law of the Nation for precedent, saying it was legal to grant preferential treatment to Jews but not to Palestinians who are victims of attacks by Jews; having no such right to compensation, they said. Diana Buttu is a Palestinian-Canadian lawyer and joins us today from Palestine. So take a step backwards for our viewers and let’s talk a bit about this Law of the Nation, and what that means, where it came from. A quick history of that. DIANA BUTTU: I think it’s important to put it in its proper political context- political and legal context- which is that since Israel’s establishment, since the Nakba and the establishment of the state of Israel in 1948, Israel has always made it that there are separate and preferential treatment for Israeli Jews, and lesser treatment for people who are non-Jews. So Palestinians who are citizens of Israel, and Palestinians who are living under its military rule in the occupied territories. And what was happening from 1948 up until July 19 when this law was was passed was that when faced with this question of is Israel a Jewish state or is it a democracy, the Supreme Court time again ended up siding on the side of Jewish state. And so we saw this very clearly when it came to things like the Citizenship Law, which prohibits or does not allow Palestinians who are citizens of Israel to bring their foreign spouses who live- who are from Arab countries, or even from the West Bank and Gaza Strip- to reside with them in Israel or in Jerusalem. We saw it also when it came to different court decisions surrounding whether Palestinians were able to purchase land and live in areas close to Israeli Jews. So time and again we’ve seen that when the choices had to be made between Jewish state and democracy, the Supreme Court always chose the side of Jewish state. What happened which is different this time around is that all of this was going on, and it was a wink and a nod, and everybody knew it was happening. But with this government, with this Likud government and this right-wing coalition, they wanted to make sure that this is actually enshrined in law, not just simply something that the Supreme Court has been doing routinely since 1948, but they wanted it actually enshrined in law. And this is where we are now, we are now headed, or is where we’re now at, which is we have apartheid actually formalized and enshrined in law rather than in the wink and the nudge that it had been given for for 70 years. MARC STEINER: So just be clear, so this law, this new Law of the Nation, does it refer to Palestinian citizens of Israel proper? Or does it refer to all Palestinians, or just Palestinians the occupied territories, who let’s say in this particular example would have no right to petition the court for early release? MARC STEINER: Which is a very right-wing party, we should just add for people. An extremely right-wing party. DIANA BUTTU: Right-wing party. Avigdor Lieberman who was once the foreign minister and now considered defense minister is himself a settler who’s called for the chopping off of heads of Palestinians, who has tried to push through legislation saying that if you are not loyal, your citizenship should be revoked. Is a very right-wing man who’s also pushed through a number of different settlements. He’s got a nice history of being a right winger, and also being somebody who’s called for the annihilation of Palestinians. So this is- I’m not surprised by his history. But his party is the party that has been pushing to make sure that Palestinians are not able to take their cases before the Israeli Supreme Court, or the High Court. And his contention is that Palestinians shouldn’t be able to access these courts. And on top of his contention that they shouldn’t be able to access this court, he’s also been trying to erode the ability of human rights organizations to do the same. So this is a man who has taken a very fascist position. That being said, I think it’s important to keep in mind this has not been a Supreme Court that has been very friendly to Palestinians. A large number of the members of the Supreme Court are themselves settlers now. So the idea that we can somehow get justice from this court is a fiction. What’s different this time now is that it’s an attempt to completely strip away any rights. And again, this is a buildup. We’ve seen this happening for a number of years where Palestinians from Gaza had been barred from being able to bring forward claims. Those from the West Bank have been barred from being able to bring forward claims. This is now just making it more obvious what has been in practice for quite some time. MARC STEINER: So how do you think this law will play itself out? I’m curious both in terms of our listeners, the viewers, both in terms of what happens in the occupied territories, as much as I am and what happens to Palestinian, Christian, and Muslim residents of Israel. I mean does this law have different consequences for those populations living in different places? Or is it one and the same? DIANA BUTTU: Well, we’ll wait and see what’s going to happen. 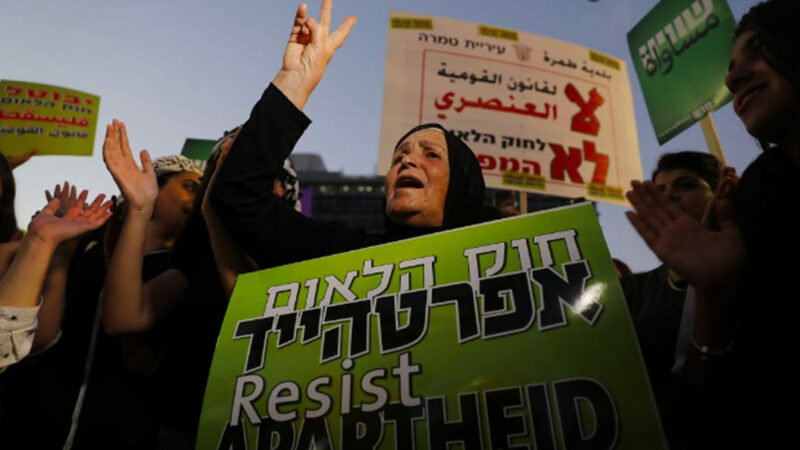 There is now a group of human rights activists and members of Knesset have now petitioned the Israeli High Court to review this law. But it’s, you know, you’re asking the judge to also preside over over all of the things that they themselves have enacted all of these years. So I’m not very optimistic about the Supreme Court overturning this, or or in any way treating this with with the level of gravitas that they should be, which is to say that it’s apartheid. I do think that it’s just going to simply play itself out. Now, what does that mean? It means that what we now see is an enshrining of Israeli practice into law. So we see everything from the idea that that Palestinians are not allowed to buy in certain places, or that Israel can discriminate against Palestinians who seek to purchase land simply because they’re Palestinian, or we see that other pieces of legislation where Palestinians are not allowed to take up certain positions, or that they’re not allowed to be entitled to family reunification because their family members were people who fled from Palestine in 1948. We’re going to continue to see much more of that play itself out. MARC STEINER: So what does this mean, then, for the struggle of people in the occupied territories specifically? Because what we’re seeing here, at least from what we’ve been reading in the press and what we’re seeing that’s happening in the courts at the moment in Israel, is what I said at the top of the show, that if you are Jewish and a settler and have been attacked by a Palestinian, for whatever reason, you deserve greater compensation. But that Palestinians who are attacked by settlers deserve no compensation, because this law is now reserved only for Jewish settlers, and for Jews in general. Which is extremely troubling. I mean, I would just add as an editorial caveat, for me it’s really troubling to see this happen, to see my, kind of, own people instituting laws like this is painful. So I’m curious, what will be the effect of this? I mean, because the Israeli prisons are vastly overcrowded. A lot of those prisoners are Palestinians, not just Israeli Jews. So what do you think the effect of all this will be? DIANA BUTTU: The effect is going to be much the same. And what I mean by much the same is that we’ve already seen for nearly a decade now that these, these same issues have been treated the exact same way by the, by the Supreme Court. For example, for a Palestinian who wants to file a claim against- a Palestinian in Gaza who wants to file a claim against the army for destroying their home, for killing their loved ones, the level to which a Palestinian has to go, the guarantees, the financial guarantees they have to put before the court have made it prohibitive. And we’ve seen that since 2005 that it’s been virtually impossible for a Palestinian from the Gaza Strip to bring forward claims against the Israeli army. And so in short, Israel gets to kill with impunity. Similarly, Palestinians in the West Bank who also want to file compensation claims against settlers similarly have to provide financial guarantees and be supported and have that financial backing to be able to file suit against Israeli settlers. Yet that same demand is not in place for Israeli settlers. So all that we’re seeing is that this is now an enshrining of current practice that is in place. And what we’ve seen over the course of the past, the past two decades is that with these practices that are in place that Israel is trying to make it virtually impossible for Palestinians to have their day in court, while at the same time demanding that every Palestinian go to court in order to be able to get some redress. I’ll give you a quick example. There are women in the Gaza Strip who have been been trying to get out of the Gaza Strip to get cancer, to get their cancer treated in hospitals- by the way, either at their own expense or at the expense of the Palestinian Authority. And what the Israeli government has done is instead of giving these women permits to be able to get treated in an Israeli hospital, again at their own expense, or in another hospital in Jordan or in another country, what instead the government is saying is that if that individual, herself or her extended family, is a member of Hamas, then they aren’t going to give them permits. Now, bear in mind that there aren’t in cancer treatment of deliveries in the Gaza Strip. So what they are demanding is that rather than human health or one’s health being a human right, instead it’s become a privilege. And the only way that a woman is able to get access to health is if she herself petitions before the Israeli court. We see this right now with a child that is in in Hebron, born in Hebron with a very rare condition, where his mother also wants to get him treated in a hospital in Jordan- again, at her expense or the expense of the Palestinian Authority. And the Israelis are not letting her travel. So she also has to go to the Israeli High Court to petition to be able to just be able to leave to get her child treated. This is what Israel has done, is that everything must now go through a- there is no, there are no rights any longer. Everything must be adjudicated and go through the High Court, while at the same time limiting avenues for Palestinians to be able to go to the High Court. MARC STEINER: So finally, because I know you have to go teach, we’ll wrap this up, is what recourse do Palestinians have within the Israeli judicial system for what you’re describing, as well as this new law? And are there other places people can petition outside of Israeli law, internationally, I mean? What legal recourse do people have? DIANA BUTTU: Look, I don’t think that anything is going to change from within in terms of Israeli society. This is a society that has been pushed- that has pushed itself more and more and more to the right. And talk of everything from expulsion of Palestinians to, as they call it, transfer of Palestinians, which means ethnic cleansing of Palestinians, is now very commonplace. So I don’t see that there’s going to be any recourse within the Israeli system itself. I do, however, think that there will be pressure brought to bear, the more pressure that’s brought to bear on Israel from outside, and starting to treat Israel as the apartheid state that it is will bring about change. But simply looking to avenues from inside is practically hopeless. We’ve seen that these measures have been tightening over the decades, and now we’re just seeing that the final touches, the finishing touches are being put into place. MARC STEINER: Diana Buttu thank you so much for joining us. This has really been enlightening and a great conversation. Take care, and thank you so much for being with us here at The Real News. DIANA BUTTU: My pleasure. Thank you. MARC STEINER: Thank you. And I’m Marc Steiner here for The Real News Network. Thank you all for joining us. We’ll be talking together soon. Take care. Diana Buttu is a Palestinian-Canadian lawyer and former spokesperson with the Palestine Liberation Organization. She appears frequently on international media including Al Jazeera, CNN, and Fox News.